Legend leaked today when some Australian shop forgot this wasn't out yet and sold two copies of the album. This song gave me proper goosebumps. 'When your eyes did not know me like I know you" got me HARD. Oh wow I really have converted you. Ugh that was good I think it'll take a few listens to be fully appreciated. Is there somewhere you can listen to the whole album? Also it's supposed to be on spotify on Friday right? Last edited by Blurryface; 03-10-2018 at 06:59 AM. Wait Paul Meany (Mutemath, he was a co producer on Trench), has confirmed the leak was intentional once again. If I could choose everything I would. Jumpsuit, Levitate, My Blood, Chlorine, Smithereens, Neon Gravestones, The Hype, Pet Cheetah and Legend I've heard Most and remember most about. The others are all amazing,but they'll take more time to appreciate. Why would you intentionally leak your work idgi? They've never not leaked their work, they just want it out there as soon as possible. And they have the fan base that will still buy the album anyway. I think the actual album leak could have been a fan from Australia as their shops forgot it wasn't out and sold a few however their last album, Heathens, and all singles on this one, were intentionally leaked. Wasn't Jumpsuit one of the two tracks released a while back ?? I remember being distinctly underwhelmed by it .. It wasn't the first released yes. Lyrically it's not living up to their prior stuff, but musically it's a massive step up and shows their growth. Sorry but I'm not even sure I understand what you mean in your first sentence..
My mistake, that's my crappy autocorrect changing 'was' to 'wasnt' as it often does. I get where you're coming from with the bolder part, but I think one of the crucial things with twenty one pilots are the lyrics as it sounds really what sets them apart from the crowd. Personally though I Loved then 'Melody' for Jumpsuit and I think the use of bass was excellent. I've added all of the audio. 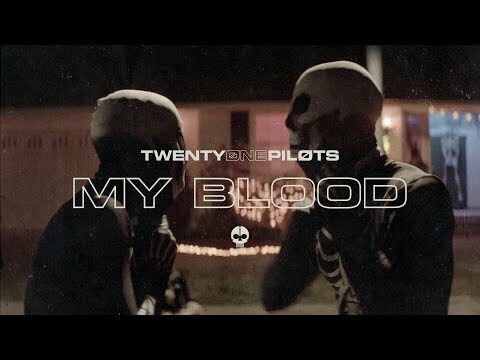 My Blood had a music video drop today. So different from their others, but I really love it. Not a big fan of these but "Cut My Lip" is amazing.